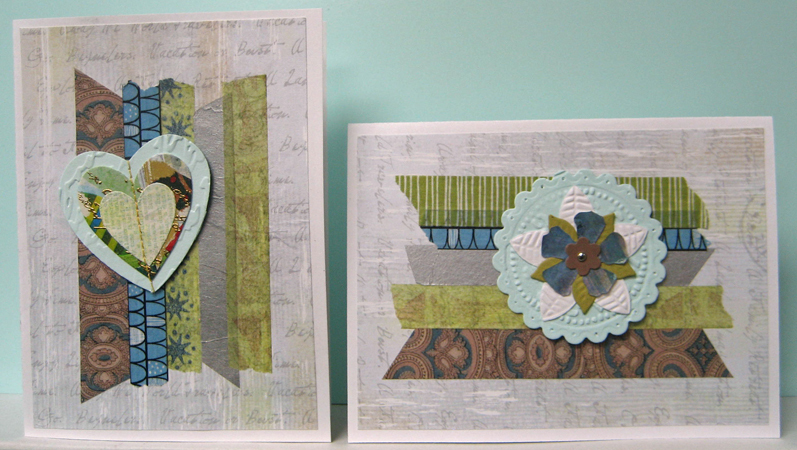 Feeling very positive about the results of my first two sets of cards (set 1) I worked on this set!! I started by gluing my washi tape/decorative paper backgrounds to white card fronts. You can see that the decorative paper has subtle script and design elements. For my first card, I decided on a layered heart embellishment!! 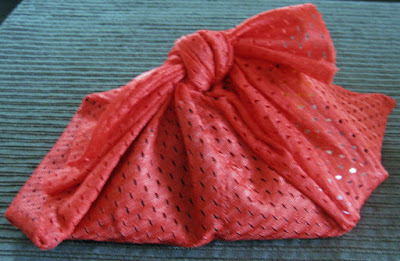 It is such a versatile element appropriate for birthdays, anniversaries, thinking of you, etc. I started with a small decorative paper die cut which I layered onto a serendipity heart die cut and then onto a large manually embossed heart die cut. I machine stitched them together with yellow thread gluing the ends to the back with regular tape. I mounted this heart focal element to my layered card front. For my second card, I started with a small brown flower punchie, added it to a blue flower punchie made from hand decorated paper and then layered that over a green embossed die cut flower. I used a manually embossed five petal punchie (SU) in white as the base and tied them all together using a tiny silver brad. I adhered this floral element onto a manually embossed scallop circle die cut (N) with paper pierced scallops before mounting this focal element to my card front using 3D foam tape. For my third card, I decided on another bird because it lends itself so well with the " a little bird told me..." saying which is a good lead in for almost any occasion. I punched the bird (SU) from blue cardstock, coloured in the beak and added a tiny black brad for the eye. I punched the wing from silver card and manually embossed it before adhering it to the bird. I punched the branch from green cardstock, mounted it to a pierced and manually embossed scalloped circle (N) then mounted the bird above it using double sided tape. I added the folded piece of ribbon to the back using double sided tape and then mounted the whole element to my card front using 3D foam tape. 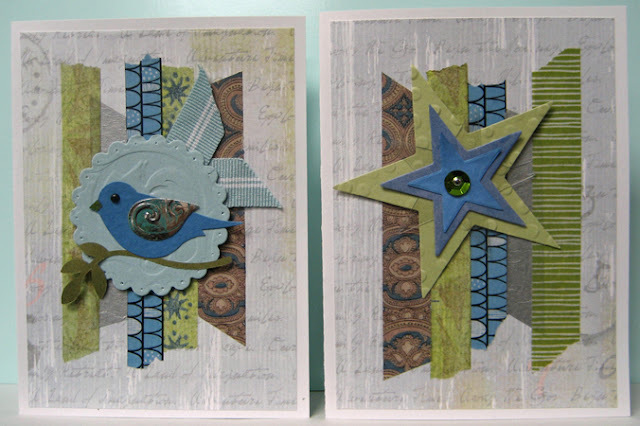 For my fourth card, I layered four stars (green manually embossed, clear plastic, dark blue, lighter blue), added a green sequin and tied them all together with a tiny silver brad. This focal element was mounted to my layered card front using 3D foam tape. Stars are great for many occasion including birthdays, special accomplishments and new babies!! Really loving this process and finding that these cards stand on their own without greetings.